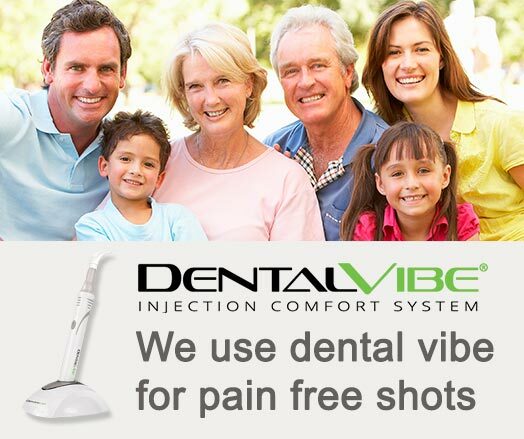 At Munster Dental we have implemented DentalVibe 4 into our dental practice. DentalVibe is a handheld device that allows our dentist to deliver local anesthesia pain-free while prepping the patient for dental procedures. It works wonders with young children that are sensitive to the idea of needles. The patented vibrating action desensitizes the area before delivering the now hardly noticeable pin prick without the fears and nervous feelings aroused by needles. This concealed method puts adults and children at easy without ever knowing they are getting a shot in their mouth. Just one way we are committed to total dental health to support the entire patients well being. In order to keep your mouth sensationally clean you will want to follow the correct steps for flossing your teeth. Step 1: Wrap the floss several times around the middle finger of each hand. Step 2: Using your right and left index finger and thumbs you will place your hands in 1 of 3 positions to clean the upper and lower teeth. Step 3: To floss the left top side of your mouth place your Right Thumb and Left Index finger under the floss. Change position by placing your left thumb and right index finger under the floss to clean the right upper side of your mouth. Step 4. To clean your lower teeth point your fingers like little toy guns then turn them downward onto the floss so that the finger nails of each index finger are facing each other and close together. step 5: Watch the video for further clarification. Munster Dental Health focuses on personal care. This means giving the time and attention to each patient to ensure a comfortable pain free environment. We want to stand out as a practise where talent, dedication, and family values flourious. Will you help us stand out by sharing your dental experience at our office with others. We thank you in advance for your time and honesty. Help us bring quality dental care to our community. We don’t just provide quality dental care, we believe that dental health is an important part of your total health. With over 35 years of experience, we treat patients the way we would want our families treated. We offer no gimmicks or discounts, just quality dental services at affordable prices. We have been located and serving in Munster Indiana for over 35 years, but have patients all across America. We offer no cost consultations, free second opinions, with a focus on family oriented service, in a comfortable relaxed setting. We have a good relationship with dental specialists and refer when advisable. Get in touch with us today.